The Province of Cádiz offers a fascinating array of landscapes and villages. In my opinion, it is the most varied of all of Andalucia's provinces. 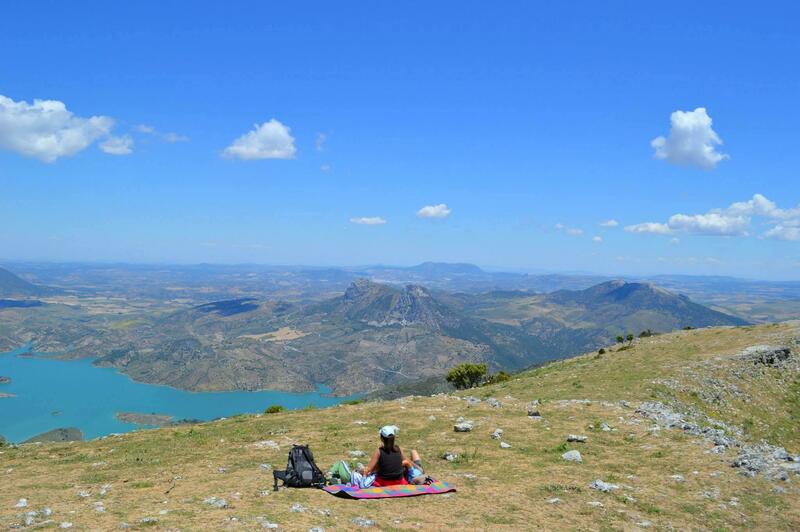 From the sweeping beaches of the Costa de la Luz, to the 'jungles' of the Alcornocales Natural Park, the 'I-can-almost-touch-Africa' El Estrecho Natural Park and the most prized of all, the majestic Sierra de Grazalema. The Parque Natural Sierra de Grazalema is an important mountain wilderness, unique to Andalucía. A UNESCO Biosphere reserve and one of the most breathtaking of all of Spain's natural landscapes. The predominantly limestone cliffs date from the Jurassic and Triassic periods and their unique situation, being the first mountain range that meets many of the clouds coming in from the Atlantic, gives rise to an exceptional micro-climate. 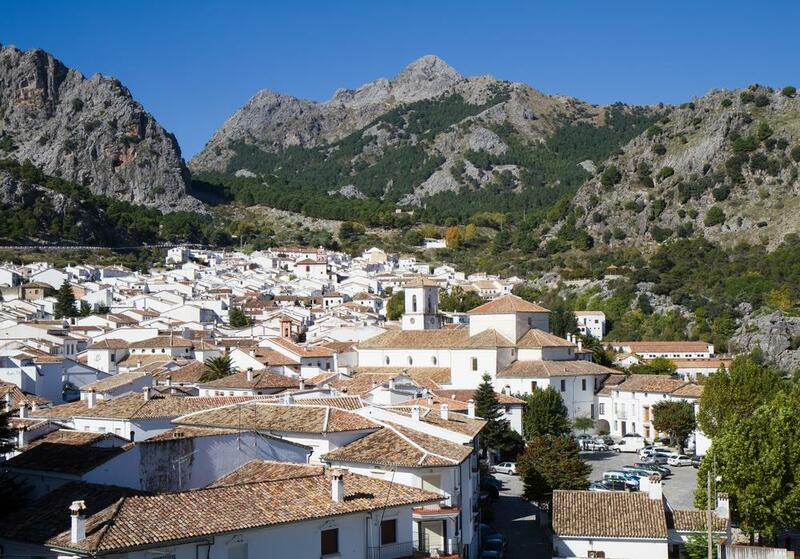 The whitewashed village of Grazalema that sits right in the heart of the park receives the country's highest rainfall. The result is a botanical paradise. Over 30% of all the species of plants found in Spain are represented in Grazalema, including numerous species that date from before the Ice Age. The most famous of these, is the rare Pinsapo, or Spanish ﬁr, native only to Grazalema and the Sierra de la Nieves, in Málaga. Every valley, every cliff face, every mountain top is different. You couldn't hope for a more paradisical and varied natural area. The only way to truly appreciate the park is by walking. To protect this unique environment, access to many parts of Grazalema is restricted, particularly during the summer months, due to the high fire risk. There are so many beautiful routes in Grazalema, it is way beyond the scope of this article to describe the possibilities. Needless to the say, they are almost unlimited. There's everything you'd want and more. One of the best family walks in the area is the one described below. From the village of Grazalema, take the CA531 road. The windy mountain route takes in some of Andalucia's most picturesque scenery and is the backbone of the famous Pueblos Blancos route. Following the CA531, going in the direction of Zahara de la Sierra, the road climbs steeply and eventually reaches its highest point, the Puerto de las Palomas, the Pass of the Doves. At 1350m, it is the second highest pass in Andalucia. The walk starts from here. Many people make it to the viewing point at Puerto de la Paloma, but with a bit more effort, you can get unbridled views across the whole area. The mountain that sits directly in front of you, is known as Cerro Coros, 1.328m. From the top, you get a real 360 degree experience. On a clear day the views are exceptional. There are two ways to get up the mountain. The quickest and most direct, is by walking across the road from the viewing point at Puerto de la Paloma. There’s a small asphalt path leading up. Don't be put off by the gate, you can open and close it on the way up. Just carry straight on, walking past a small concrete hut and a couple of stone goat pens, the Cerro Coros is straight ahead. Make your way up the mountain as best you can. There are tracks leading up. A far more scenic route, is the circular one. Despite being longer, just under 5kms, the views are truly breathtaking. Instead of walking up the path that is across the road from Puerto de Paloma, take a left and follow the path up the mountain. This is the track we followed and found to be spot on. The path is well defined and easy to follow. It winds around the side of the mountain and starts to climb. During the last few hundred metres the track is less defined and you need to walk across the countryside, but the peak is visible from afar and makes an easy reference point. It really is an unforgettable experience and easy enough for children to do as well. There are a couple of sections which are fairly vertical and if travelling with smaller children, it's a good idea to keep an eye on them. If you drive over the pass, the road starts on a dramatic descent onto one of the most perfect of Andalucia's Pueblos Blancos, Zahara de la Sierra. A village that is definitely worth exploring. 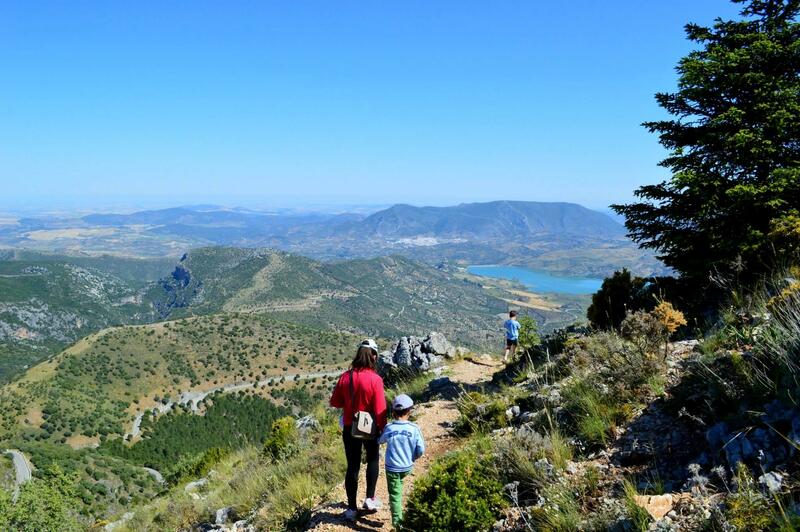 For another great family day out, cycling the Via Verde de la Sierra in neighbouring Olvera is highly recommended. A special thanks to Clive from wildsideholidays.com for pointing us in the right direction. Without his advice, this walk would not have been possible. 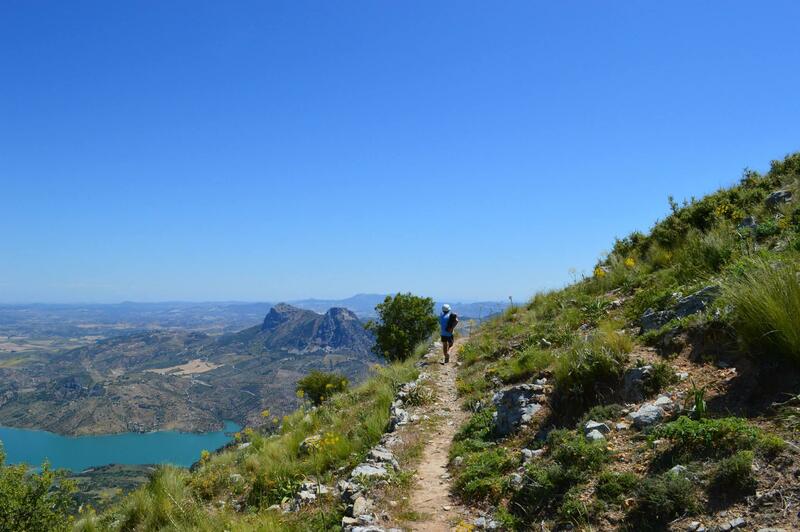 The Sierra de Grazalema is a hiker's paradise. Here's one of the most scenic hiking routes in the area.